The kids are bouncing off the walls, the same family movie has been on repeat for days, and you long desperately for the sunny days of summer ... it's official, cabin fever has set in at your house! After the holidays pass, the winter months can seem endless. Instead of getting anxious, why not get creative? This time of year I love to try new, fun activities with my family to break winter boredom and encourage learning and bonding. Here are 5 snowed-in activities perfect for those days when cabin fever is at its highest. What other things do you like to do with your kids during wintertime? 1. Bake together If you're stuck inside, why not head to the kitchen to bake something delicious? 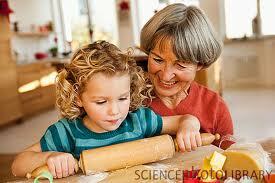 Baking is fun and educational, plus many steps are appropriate for all ages. Banana bread is a favorite at my house! You can let little ones mash the bananas and older kids can measure and stir. 2. Let it snow, inside! If you live in a region with snow but don't feel like going outside, place baking pans on the table and fill a few bowls with snow and let kids have at it. I set out spoons, small sand castle molds and cookie cutters, and my kids' creativity overflows. The pans contain the mess and our toes stay toasty warm. 3. Rainbow soap Want some good clean fun? Try this recipe from Fun At Home With Kids for creating fluffy clouds of colorful soap your kids will love. What fantastic sensory play as they swirl and whirl the colors together! Just try to resist joining them in the fun. 5. Five senses walk Sometimes the best way to put Old Man Winter in his place is to go outside and enjoy some fresh air. Bundle up for a five senses walk at a local park or simply in your own backyard. Talk about what you hear, see, smell. Does the air taste different? Catch a snowflake on your tongue! What does the tree bark, snow or pine cone feel like? Don't blame us if this special walk just happens to end in a snowball fight!